I had to go on a trip to rescue a friend who was in the hospital and was being released. 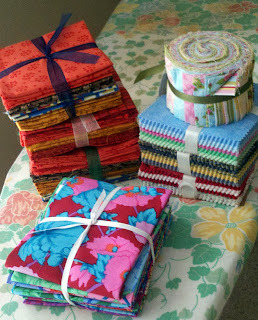 But on the way, I stopped by a store that is not really a quilt shop or fabric store. Another friend had scored a nice fat quarter bundle (at a great price) in the chain store near her home. I must say I had a bit of longing to find such a deal Ha! I hit the store just as the doors opened for the day. I went up and down a few aisles and found some shower curtain hooks that were much needed. Then I spied one lonely fabric pack, so I picked it up. At the end of that aisle there was an end cap that was a gold mine for me. Yikes! what to get??? When in doubt, buy it all. LOL Not really but I was shocked at how much I had spent when the cashier rang it up. Just over fifty dollars. My planned budget was "no more than $30." Oh well! I didn't go over that much. Let's see: I got three 12 packs of fat quarters, one 15 pack of fat quarters, three stacks of 100 five inch squares and one roll of 24 jelly roll strips. The 15 pack of fat quarters is Free Spirit by Westminster. The are all as pretty as the one on top- big vivid florals. 100 red/black/white; 100 pastel blenders; and 100 grey/black/gold. The grey/black/gold is unusual for me. I almost never buy grey so I am trying to stretch. The roll of strips will be offered to a co-worker if she is interested. were purchased with a co-worker in mind. I gave her a jelly roll that I bought and decided that I would probably never use. She used it to make a lap quilt - then I wished I had kept it. LOL. I think I made a great purchase at Tuesday Mornings. Thanks for the heads up Barb. Sweet! Congrats on the finds. I bet I know where you went Gene. Glad you found some fabrics you like. I have never found any at the store I'm thinking of that I thought were nice. You ended up with some wonderful purchases. I wish we had one of those stores here. You got a great deal! I love bargains like that! I have a few of those out of the way places I know I can find fabric at, but you sir got a great deal! I'm still looking for that baby quilt I saw on here a couple of days ago. Anyone know which blog it was on?? Nice purchases and price! I am limited to online shopping but I am always looking for that great deal. I think you got one! Wow...we have a Tuesday Morning not far from us....would never have thought to look for fabric there. Will have to check it out. That seems like a really good buy to get all that for around $50. Thanks for the reminder. I was out today and totally zoned out on TuesAM. I'll definitely head over there tomrorow. That looks like Kaffe or Philip Jacobs fabric in the one FQ pack. Great score! Wow, that was quite a find and I think it was worth the money. To bad there isn't one of those around here. Wow!! Love it - didn't know Tuesday morning carries fabric? I have never seen any the few times I went there. May have to check that out sometime!! Good catch! Our Tuesday morning closed!